The BC Dairy Foundation in British Columbia, Canada, is promoting the power of milk in the Weak Shop, a suite of products to help compensate for limbs that are limp due to lack of milk consumption. First off is “Chair Pants”, a humorous infomercial that takes sitting to the next level, to be supplemented with the food lift, downhill treadmill converter, wallet walker and long arm tennis racquet. 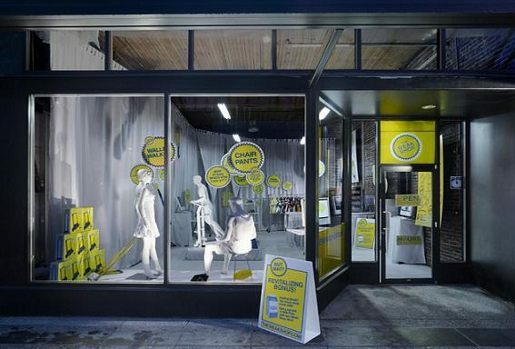 The Weak Shop opened its first retail location at 1058 Granville Street in Vancouver on October 15, 2009 and will open a second location at 530 Broadway Street later this fall. Chair Pants attach easily to any existing pants. A rigid, yet supple polypropylene cup gently cradles your behind. Sturdy carbon fiber rods support up to 1000 pounds (454 kilograms). To activate your Chair Pants simply make a sitting motion. Stand up and the Chair Pants legs fold neatly away. A patented rod hinge allows the Chair Pants legs to hang down when not in use. See photographs of people wearing gear from the Weak Shop online at Flickr. See the Weak Shop YouTube channel, and the BC Dairy Foundation Video channel. 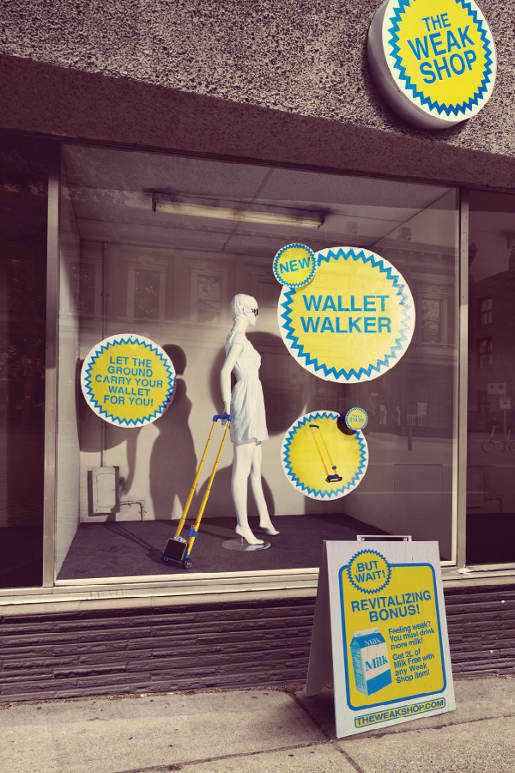 One of the transit shelter ads shows the Wallet Walker “a wallet carrying vehicle” for $19.99. 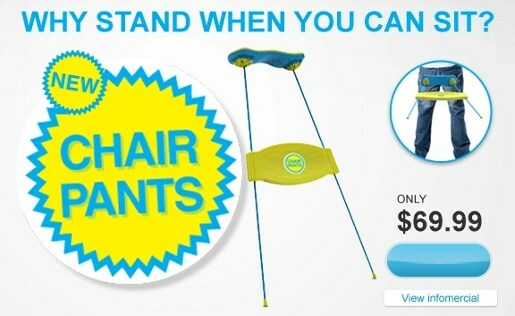 An infomercial features chair pants, “a mobile sitting accessory” for $69.99. All items come with a free two-litre carton of milk. And, anyone leaving the store gets a sample of milk. The Chair Pants ad was developed at DDB Canada, Vancouver, by creative directors Dean Lee and Cosmo Campbell, copywriter Kevin Rathgeber, art director Colin Hart, and agency producer Ryan McCormick. Filming was shot by director Benjamin Weinstein at Steam Films, Toronto, with executive producer Kevin Walter, producer Matt MacLennan, director of photography Phil Lanyon, industrial designer Robert Johnston, editor and colorist Jonathan Morris. Rob Johnston, owner of Tangrem Design, an industrial design firm in Vancouver, designed the prototypes. Sound was mixed at GGRP by producer Peter Clarke and engineer Keith White. Casting was arranged by Sean Milliken.